Following the memorial service for Daryl Coley, I stood in awe at the numerous social media posts, re-posts and comments — both of B. Slade’s virtuosic performance of Donald Lawrence’s “When Sunday Comes” and the video clips of Bishop Yvette Flunder’s singing “When We All Get to Heaven” and offering final words of prayer and committal over the remains. Bishop Flunder and B. Slade served the family and the gathered congregation with the highest degree of artistry and pastoral care possible. Every time I have witnessed these two operate in public spaces, they always bring their “A-Game!” Always! This was nothing different. What gripped me the most, however, was the overwhelming demonstration of respect, acceptance and encouragement modeled by the congregation as B. Slade and Bishop Flunder operated in their assigned roles. I was both proud and puzzled. I was happy but curious. A tremendous amount of anticipation and angst emerged as I watched these video clips circulate the channels of social media. So what happens to this level of respect and appreciation at the conclusion of the memorial service? To where does it evaporate? How can the black church publicly affirm these gifts and be so quick to condemn the packages in which they are encased? Is it possible to affirm the art without any regard to the flesh used to bring about the art? Why does it take someone dying for us to do the work, individually and corporately, to create space for grace for LGBT folks, and then later pretend we never possessed that grace-capacity? with the queer flesh in that pulpit who engaged you in that experience? In the clips I saw, I never heard one person shout “boo” or “get off the stage” or protest in some outwardly way that would undermine the role of each of these artist-pastors. What I did witness was a religious collective’s ability to sit with, worship with, and celebrate with an enfleshed representation of what many of them, in a different setting, would have called an “abomination.” Where does this kind of temporary hospitality come from? Did this happen only out of respect for the deceased and the grieving family? Did this happen as a consequence of an unspoken agreement to tolerate these two well-known queer artist-pastors for five minutes just for the sake of artistic enjoyment? God cannot be bound by our barriers, labels and flesh? Can one applaud the art (or the Holy Spirit in the art) and totally disregard (and perhaps even bash) the queerness that accompanies the art? Is this the manifestation of the “Love-The-Sinner-Hate-the-Sin” default? How can one “be slayed” by queer performance and leadership in a hetero-normative religious environment, but in turn slay the flesh of the one who slayed? Is our slaying in vain? What other conversations, conflicts, questions, joys or opportunities does the leadership of Bishop Yvette Flunder and B. Slade provide in this memorial service? Their presence, the roles they served, how they served, and the congregational response of their witness cannot be ignored. I wholeheartedly believe their participation in this memorial service was an acknowledgement of Daryl Coley’s struggle to reconcile his own sexuality with his call to proclaim the gospel in song. Not only did their participation recognize his struggle, but it named that struggle as an inescapable, formational agent of his ministry. Could it be that queer-artist folks provide a unique, undeniable gifting that brings a distinctive kind of grief-comfort not found in their hetero-artist counterparts? I’m asking for a friend. 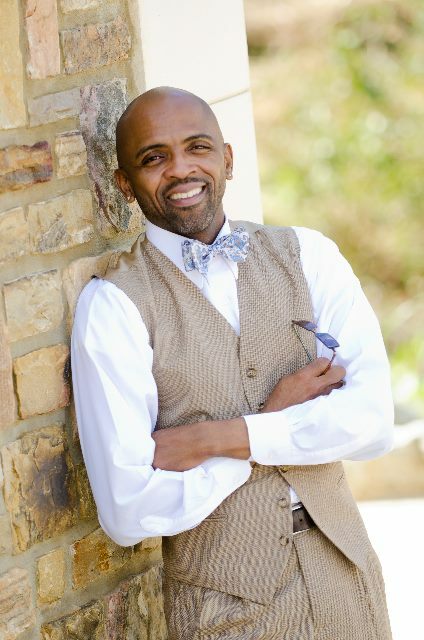 . .
Dr. Tony McNeill serves as the Director of Worship and The Arts at Historic Ebenezer Baptist Church (America’s “Freedom Church”). He also serves as Program Director of The African American Institute of Worship, Preaching and Sacred Arts at Johnson C. Smith Theological Seminary in Atlanta, GA. Affectionately known as “Dr. T.,” he is sought after as a workshop clinician, lecturer, consultant, mentor and guest choral conductor throughout the country. Dr. McNeill has degrees from The Florida State University and the Robert Webber Institute for Worship Studies. This entry was posted in Blog, Congregational life, Gay/lesbian, Gender, Opening to change, Respectability, Sexual orientation, Theology. Bookmark the permalink.